Sweet 100 tomatoes produce small cherry-like fruit on indeterminate vines until frost. They grow in long clusters and need to be staked or grown on a fence. The sweet fruits are very high in vitamin C.
Outstanding Features: Good resistance to Fusarium Wilt, Verticillium Wilt, Root Nematodes and Tobacco Mosaic Virus. 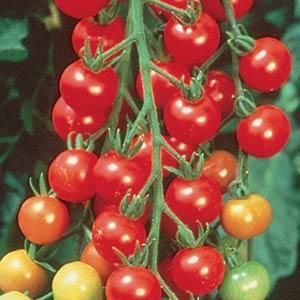 Click here to buy Sweet 100 Tomatoes direct from www.buygardenvegetables.com. i just started growing these tomato plants. i planted next to some green bell peppers. All the sudden over night all the leaves have to started wilting and the plant looks like its dying. there’s no bugs and i keep the soil moist and gets plenty of sun. i’m not sure whats wrong with it. please help me bring back my tomato plant..
Curled leaves is usually a sign that the tomatoes got too cold. Temperatures below 40 degrees F can cause this. A frost or a freeze will generally turn the leaves black. You can protect your plants from cool temps by covering them with a sheet or a blanket on cold nights.